Sarkhan Vol followed the whispers of the spirit dragon Ugin back into Tarkir's past, with no idea what to expect. He found a glorious world, full of hungry dragons and vigorous clans. But all is not well in ancient Tarkir. Yasova, khan of this era's Temur clan, revealed to Sarkhan that she is following the guidance of a dragon as well. Unbeknownst to her, her patron is—or will later become—Sarkhan's most hated enemy: the unfathomably ancient dragon Planeswalker Nicol Bolas. Now, Sarkhan races against time to find Ugin before Bolas can set Tarkir's history—and Sarkhan's own—on the path to ruin. 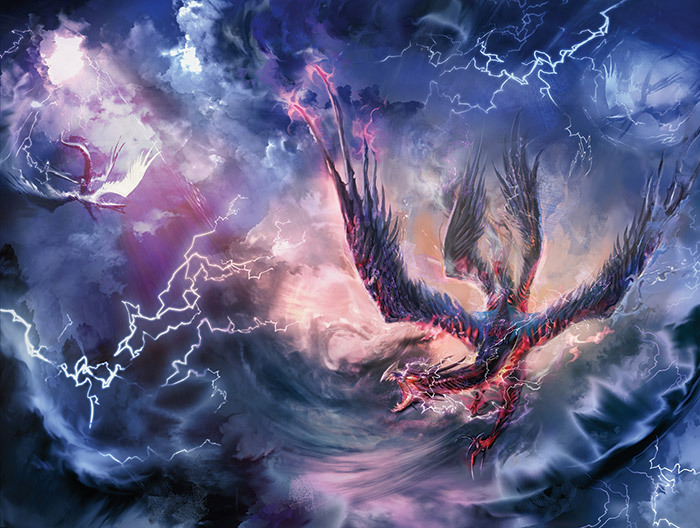 Sarkhan thrashed his wings against the frigid air, flying over the tundra toward the churning storm. Thoughts flashed across his mind, mirroring the pops of lightning and mana illuminating the tempests ahead, thoughts that broke into nothingness like brittle ash. He had traveled all this way, shattered the laws of time and history—and for what? He had found a time when dragons still lived, when dragon tempests still birthed mighty sky tyrants onto his world, when warriors sought glory by clashing with dragon-kind—but it had amounted to nothing, because the shadow of Nicol Bolas loomed even here. Even in this precious place, a time long before the mistakes of Tarkir's history, in a refuge hidden centuries before Sarkhan's own errors of judgment—the influence of Bolas had somehow made it here before him. Sarkhan spat a blast of fire at the air and flew through it. Do you understand now, dragon mage? Questions exploded at him in roaring tones, as if voiced by the thundercracks of the storm ahead—but they were only his own mind shouting at itself. Do you see why Ugin would lead you here, to witness this? Do you grasp the lesson now? A sobering answer crept over Sarkhan's mind: perhaps the lesson of this entire quest was that fate was inescapable. That he should embrace despair and accept the iron rigidity of time, and of Bolas's dominion over him. In a flash, the grim, circular joke of it all took shape for Sarkhan. Bolas had killed Ugin over some ancient feud. Ugin's death ended Tarkir's dragon tempests, which wiped out dragons on Tarkir long before Sarkhan was born, and the clans rose to rule the plane. The clans' remembrance of dragons led the young Sarkhan to revere the ancient beasts, which led to Sarkhan, in a moment of weakness, bowing his head in loyalty to Bolas, the very dragon who had made Sarkhan's obsession possible in the first place. The chain looped back on itself, inevitable and unbreakable. Sarkhan was here just to serve as witness to the forging of its earliest link. Sarkhan felt like letting his wings drop, to stall his flight in the air. He could just fall, here, as Ugin would fall. Some part of him wanted to plunge, to let gravity be his final master, to meet the ground at speed and feel everything collapse. But instead he tipped his head up, wingbeats hammering the air as he climbed. The cold tore at him and ozone filled his lungs, but he continued to climb up and up, trying to punish the clouds with his rage. There was still a chance. He still had the hedron shard with him, a piece of Ugin's chamber on Zendikar, and the thought of it pulled him onward. If he was still here, still alive, then there was a chance he could reforge the chain. If he still held on to the breath in his chest—then maybe Ugin could too. Sarkhan flew through the tempests. He could feel the wings of other dragons passing through the storms around him, and heard their roars. He broke through the rumbling cloudbank and his breath caught at what he saw. The shimmering, ghostlike dragon Ugin flew across the atmosphere like a comet, dragging a tail made of storm. Sarkhan knew Ugin instantly, as surely as he knew the sun or the earth. 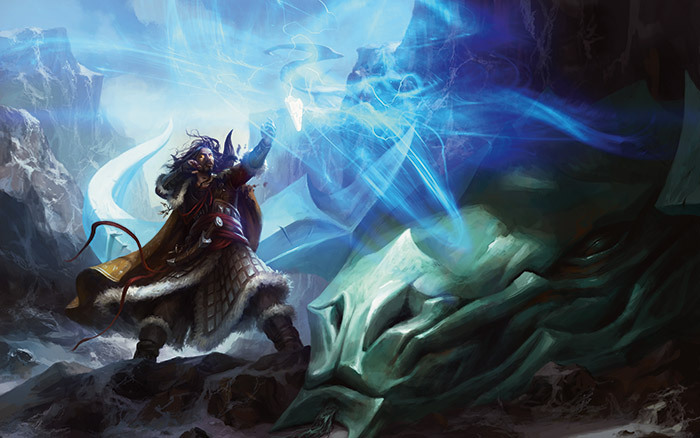 Pale blue mist trailed out behind the spirit dragon, merging with the tempests, like a cape that spread out to connect him to all of Tarkir. Sarkhan forgot everything that had brought him to this moment, and his soul stirred. 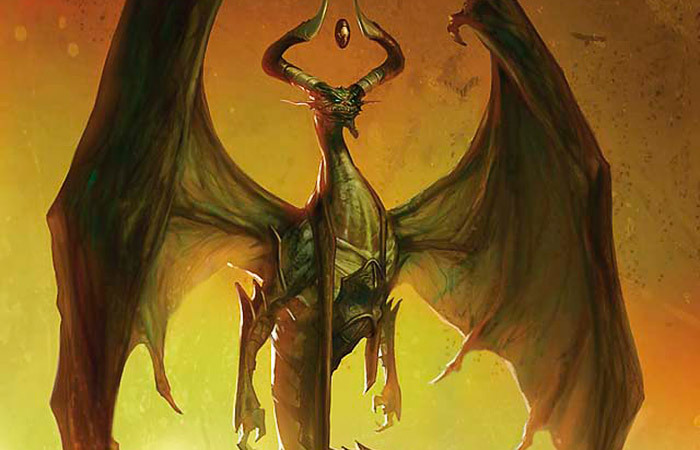 It was Ugin—and not Bolas—who had truly birthed his fascination with dragons. 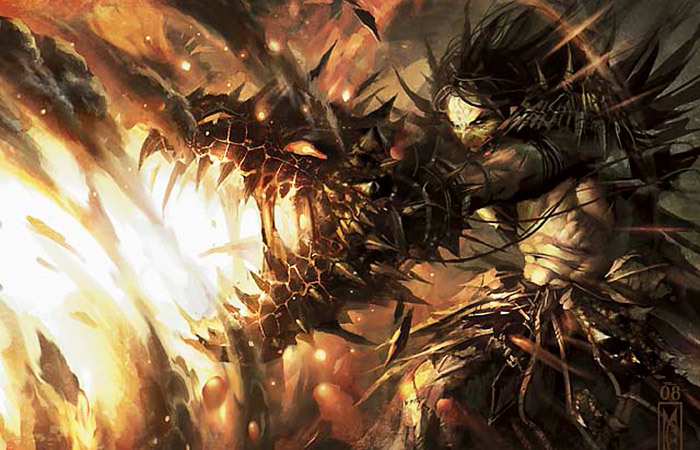 Ugin was the true beginning of the chain that made Sarkhan who he was—and made Tarkir what it should have been. Sarkhan felt like staying in dragon form forever, dancing in the clouds around this immense and wise progenitor. He flew at a distance, just watching Ugin's wings hold him effortlessly in the air. Or at least he would help Ugin fight Bolas when the time came, so Ugin would survive and Tarkir's dragons would never die out. Sarkhan sped toward Ugin, a tiny satellite approaching a great star. Sarkhan roared out to him, but it was lost in the chorus of thunder and draconic voices ringing through the clouds below. It was a tilt of Ugin's head that made Sarkhan notice the spell happening down on the ground. Sarkhan followed Ugin's eyes. Through a break in the clouds, he saw lines of greenish elemental energy tracing a curving pattern across the snow and ice, anchored at certain nodes like tethered lightning. As Sarkhan looked closer, he could see that the nodes were carved boulders, marked by slashing claw patterns. Sarkhan cursed a name in his mind. Yasova. Together, the claw-rune sites formed a pathway. The pathway marked the exact path of the dragon tempests—and therefore, predicted the path of Ugin. Yasova had been tracking the storms in order to track the spirit dragon. But Yasova's path down on the tundra was not for her own benefit. It was a guiding spell, but not for her sabertooth cat or Temur warriors to follow. This pattern was meant to be seen from the air—by Nicol Bolas. A hiss of bile and rage rose in Sarkhan's throat. And at that very moment, Nicol Bolas appeared out of a ripple of sky, like a dropped pebble in reverse, the world giving way for this being. Bolas was positioned directly in Ugin's path. His wings unfurled like a billowing cloak, shadowing the sun with his liquid-dark scales. His great horns swept up, crownlike, with his gem hovering between them. 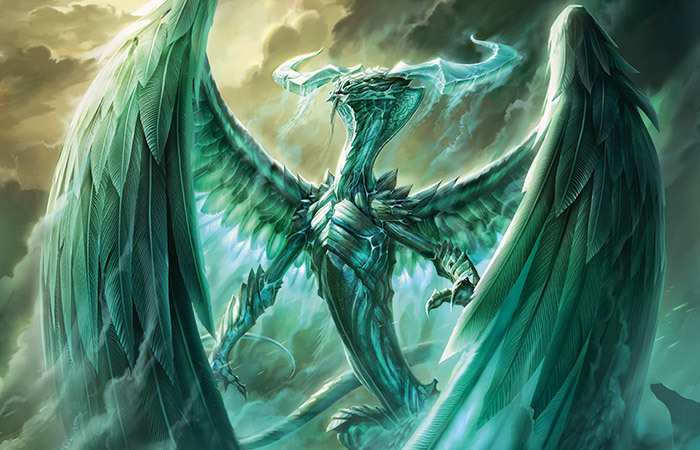 The great elder dragon's attention was focused on Ugin, the one he had come to destroy. Sarkhan was still too far off for Bolas to notice—perhaps this was his chance to strike. Ugin drew up with a flurry of wingbeats, taking in Bolas's arrival, and the two dragon Planeswalkers faced off. Bolas spoke something to Ugin, barbed words in low tones that Sarkhan couldn't hear over the wind. Ugin spoke back, calm and serious, with a note of warning, and Bolas's smile spread like a stain. The dragons spiraled around each other, great lungs and great wings churning air, eyes darting from weak spot to weak spot. The storm clouds encircled them, two titans at the eye of a hurricane. Sarkhan flew as fast as he could, but his wings were failing him. His shoulders burned as he pumped his wings, and he was losing altitude, his tail skimming the clouds. Now that he saw Bolas again, a thousand years before he had laid eyes on him for the first time—or was this the first time, now?—he realized he could do nothing that would affect this mighty creature. Bolas was like a god, Sarkhan an insect. But he thought maybe if he flew in at the right angle—maybe if he blasted him with fire at just the right moment—he could distract him just long enough so that Ugin could deal the fatal blow. He clenched his teeth and flew on. Bolas and Ugin dipped and dived around each other, occasionally switching directions, each matching the other's movements with jabs and feints. Bolas blew a gust of smoke from his nostrils and slapped at Ugin's wing. Ugin dodged to the side and made a test snap with his jaws. They threw spells, but not at each other—just shimmering runes on the air, laying mystical groundwork for the fight. They spun around each other, lashing out with a claw or a hot breath, never quite overcommitting to a strategy, never quite making the first true move. Then Ugin roared, and it was the roar of a force of nature, the roar of an entire plane. And with that roar, Sarkhan felt a wrenching impulse reverberate in his soul. The feeling spread through his draconic body, electrifying him, goading him to join the fight at Ugin's side, as if that roar spoke to the core of his very being. Some part of him was conscious of how strange this feeling was, but his dragon's brain seethed with irresistible drive. Sarkhan found himself roaring in answer, and his muscles responded. As he roared, he heard calls from all the dragons throughout the tempests. Dragons appeared in droves, flying out of the dragon tempests toward the fight. Sarkhan's heart leapt—this was Ugin's advantage. The progenitor of Tarkir was calling his kind to fight at his side, and they were answering the call. Bolas's grin dissolved. He attacked all-out with a barrage of jagged spells, pummeling Ugin with his strange utterances. Sarkhan saw Ugin recoil, chunks of glimmering scales exploding from his body, his head thrashing back and forth from some kind of simultaneous mental assault, his wings chopping at the air to maintain altitude. Ugin spun in the air and blasted back with his own magic. He cut an arc across Bolas's body with a torrent of invisible fire, and followed it up with a lunge of pale mist that struck like thunder. He pivoted in space, firing forth more invisible impacts. Bolas slapped away half of the assaults, but many of them landed, and Sarkhan saw the effort in Bolas's face. Determination surged through Sarkhan, making his skin prickle with heat. This could be the crossroads of history, this moment. Tarkir dragons closed in in from every direction, a circular army collapsing in around its leader. Sarkhan even saw new dragons spawning from the clouds, each one born with a mission to fight for Ugin. Yes, said his draconic heart. Yes, destroy the all-father. Destroy the progenitor who commands us. Destroy him, and be free of his rule. No, said some small part of Sarkhan. No! All around him, the other Tarkir dragons were seized by the same spell. Yasova's power drowned out the force of Ugin's call, and the dragons converged on Ugin instead of Bolas. Sarkhan was close now. He could feel his ribcage filling with heat. He could feel himself wanting to unleash fire on Ugin, the very source of draconic spirit on Tarkir, the very dragon who brought him to this moment. He exhaled. But as his breath was about to emerge as fire, instead he shouted a savage "No! "—a human word, shouted in a human voice, as he forced himself out of dragon form. His wings collapsed inside him. His face became stubbled skin instead of overlapping scales. And his drive to kill Ugin melted away, as the spell no longer gripped his draconic mind. What gripped him instead was gravity. He fell. And it was a long fall. He fell past the Tarkir dragons, who breathed their fire and lightning and death onto Ugin from all sides. He fell past Bolas, who never glanced his way, but only watched Ugin's own progeny shriek and attack their forefather viciously. He fell through the churning clouds, and through a breathless distance of empty air. 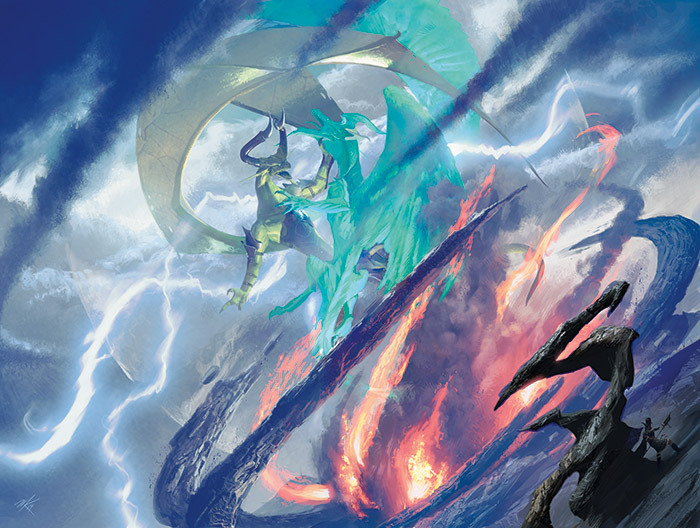 He heard a thundering crack from high above, a sound with terrible, unmistakable import—Bolas's final blow, the battle-ending deathblow that broke Ugin's body. As Sarkhan hurtled through air, he caught glimpses of the other dragons scattering like birds away from the disturbance. Before he got to see Ugin himself, there was a savage, crunching bounce, as his body ricocheted once, and then sickeningly twice against the rocks of a great spiraling crag. He took a chaotic tumble off one snow-padded cliff, onto another, and rolled down a slope, as his mind whirled along with his limbs. Thundering motion and the cracking sound of an avalanche followed, and a crushing sensation. The world was all ice and snow. And then it stopped. He was suspended in a snowbank, a foot or a mile from air, lungs compressed, suffocating. He held onto a thread of consciousness, enough to tell him that he was dying. When the claws dug away the snow above him, Sarkhan thought for a moment that it was Bolas, come to finish the job, to finally have his victory. But it wasn't. It was Yasova's sabertooth cat, clearing snow with great swipes of its paws. Its tusks bit into the back of his collar, grabbing him by the scruff, and lurched him painfully out of the snowbank. The cat laid him out on his back on the tundra. Sarkhan was a limp thing, a sack of skin with assorted bone-pieces inside. Through squinting eyes he could see Yasova looking down at him. She held his staff, with the hedron shard dangling from it. "Don't try to move," she said. "Don't try to speak." She said some other words in a low voice, and he could feel his insides begin to sort themselves out. "Don't try to speak," she repeated. But she looked up at the sky, and then back down at him. "It's just about over. The Unwritten Now will finally be free of the blight of dragons." Sarkhan twisted his eyes to one side, to see as much as he could see. What he saw was Ugin's body falling out of the clouds, streaking toward the ground. Ugin defeated. Dragons on the road to extinction. Tarkir's fate sealed. "I don't know what you are," said Yasova. "But you seem like you might have some answers in you. So do me a favor, and don't die just yet. I'll drag you back to my shamans and see what you're about." The healing spell had not completed its work, but Sarkhan lurched onto his side anyway. Everything hurt—consciousness was a wall of pain—but somehow he rolled onto his hands and knees. "What are you doing, fool thing?" said Yasova. At that moment, Sarkhan raised his head to see Ugin hitting the tundra. There was a moment, before the force of it hit them, that Sarkhan and Yasova glanced at each other. They both felt it. Something had tilted on Tarkir. The world was poised to change forever. For a moment, Sarkhan thought he saw a shadow of concern brush across Yasova's face. Then the wave of force, stronger than the power of Ugin's roar, hit them. Snow exploded into them, and the earth bucked. Sarkhan, Yasova, and the sabertooth were knocked over. Sarkhan's staff tumbled and landed in snow. Sarkhan crouched as the snow blast pummeled him for what felt like a thousand heartbeats. After the blast of snow and force subsided, he crawled back to his knees, but then huddled again as rocks and chunks of ice rained down. When the rubble-rain ended, Sarkhan coughed and shuddered. He looked for the crater, to find where Ugin's body had landed. 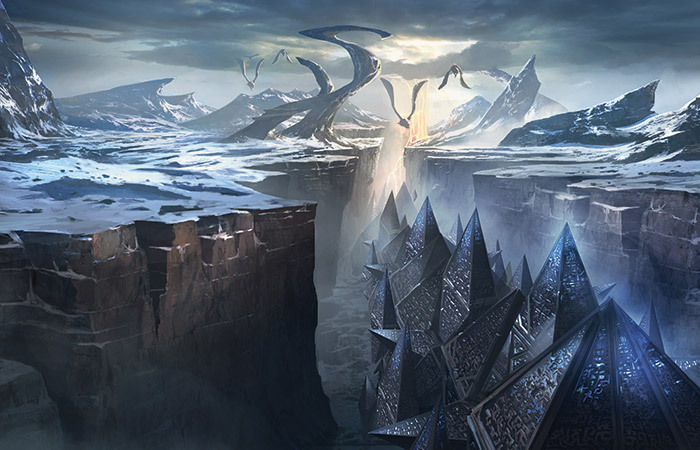 He saw the place where Ugin fell, but it wasn't just a crater—it was an entire chasm punched into the land, a massive crack of shattered earth, with Ugin's body somewhere far below the level of the snow. It was the same place Sarkhan had come to in his own time—the site of the temporal nexus. Sarkhan glanced up to see Nicol Bolas turn toward the sky and vanish. The air rippled, and he was gone, along with Sarkhan's chance to destroy him. Sarkhan climbed to his feet, climbing out of the snow and rubble. He pulled his staff from the snow, and felt an urging to move when he saw the hedron shard attached to it. "Where do you think you're going?" asked Yasova, dusting herself off. "To save him," said Sarkhan, and he turned and stomped toward the chasm. His balance wavered, and his muscles and bones protested, but Yasova's healing spell, still at work in his bones, dulled the pain. "You weren't meant to do this," warned Yasova. "I can't let you do this." Sarkhan snapped around to her. He lashed an accusatory hand at the ancient Temur khan. His hand became the head of a dragon, and that dragon's head breathed forth a flame as hot as Sarkhan's rage, blasting Yasova full on in the chest. Yasova tumbled back from the force of the spell, flying boots over head into the snow. She landed, and slumped, and let out a groan. 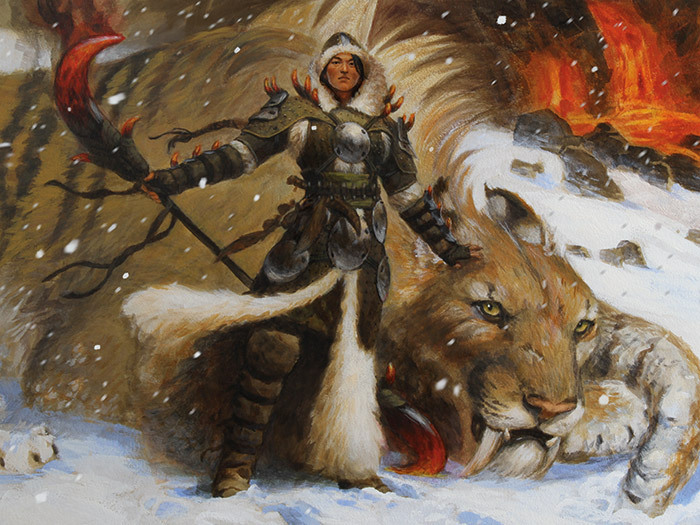 The sabertooth leaped over to her, sniffed her breath, and then snapped around to snarl at Sarkhan. Sarkhan snarled back with ten times its intensity, heaving icy breaths, his arms and legs out in challenge. The big cat flinched, then slowly lowered its head in reluctant submission, staying near its unconscious master. After one more snarl of warning, Sarkhan marched off toward Ugin. The climb down to the floor of the chasm was an awkward skid more than a climb. Sarkhan didn't take time to choose footholds carefully, and he half-slipped his way down the craggy walls of the gorge, reinjuring his already battered bones. His body felt like a broken marionette, but he continued forcing it to move, using his staff like a crutch. Ugin was laid out against the chasm floor, burned and abraded on every surface, littered with rubble from the impact. His eyes were closed. Sarkhan's heart leaped when he saw that a slow exhale was escaping the dragon's nostrils. There was still part of a breath in him, he thought. There was still time. Sarkhan ran over to the dragon. He brushed away the rubble from the twisting, runic shapes along Ugin's neck, and pressed his own face against Ugin's. He closed his eyes, and tried to feel the essence of the great dragon, tried to hear the same voice that had drawn him back to his home plane. But there was nothing. There was no voice, just the long, ragged exhale of a broken titan. Sarkhan's heart sank. The only voice was an unwelcome one, from Sarkhan's own mind, an echo meant to torture himself with old questions. Do you understand now, dragon mage? The question rang in his skull. Do you grasp the lesson now? Do you see why you had to come? "No, I don't!" he whispered into Ugin's face. "I don't understand! Tell me! Guide me!" Do you see now? Do you understand the lesson? "No! I don't! I can't!" He slapped Ugin's scales softly with his hand. "Ugin, help me, please. Help me…"
Do you understand how you must always fail? Sarkhan gritted his teeth and gripped his staff. "No! I—I can't!" Do you understand that you must always fail, as long as your goal is not truth, but guidance? "What does that mean? I don't understand! I don't see it!" …that as long as you seek dragons around you, you will never become the dragon within you? Sarkhan pushed his forehead into Ugin's scales and squeezed his eyes shut tight. He tensed every muscle in his beaten body, trying to force an answer, some missing truth, into his brain. He felt the wood of his staff start to splinter in his white-knuckled fist. Then, as Ugin's final breath slowly ended, Sarkhan unclenched. His body loosened, and he caressed Ugin's face gently. He took in a long breath, and let it out slowly. With that breath, he let out all the pain, all the uncertainty, all the struggle that suffused his body. He stood straight, opened his eyes, and breathed in and out again. "Ugin, I've brought something for you," he said. He detached the hedron shard from his staff, that small stone remnant he had brought from the Eye of Ugin, Ugin's chamber on faraway Zendikar. He held the stone in his hand. The runes on the hedron-piece glowed pale blue at his touch, mirroring the shapes etched in Ugin's face and neck. It was a piece of Ugin's shelter on another world, a piece of Ugin's edifice that he had built for himself. The Eye of Ugin was a place for containment, yes, a place to concentrate on the spell that contained the Eldrazi—but it was also a place for recuperation, a safehold in a world torn by powerful forces. Sarkhan raised the hedron shard. Its runes glowed brighter, and it hovered in the air between them. Sarkhan put his hands around the shard, gently drawing it toward him, and concentrated on what he desired. He inhaled deeply, and then slowly blew air out over the hedron—not the fire of a dragon, nor truly the exhalation of a man, but the breath of Sarkhan Vol, the dragon mage. He released the stone shard. The hedron hovered, rotating slowly in the air. Its surfaces began to glow brighter and brighter, and then it began expanding—unfolding. Planes of stone replicated themselves, shifting and sliding outward from the shard like an infinitely blooming flower. Impossible surfaces unpacked and unfolded, creating an interlocking structure that grew and grew, repeating the runes from the Eye of Ugin, from Ugin himself, over and over again. Sarkhan stepped back to the wall of the chasm. The spell was done. The hedron shards unfolded themselves faster now, creating an edifice, filling in around Ugin's body like a massive cocoon. He watched with wonder at the beauty of it. Sarkhan caught Ugin's eye opening just slightly, just for a moment, and then saw it close again. The protective cocoon assembled itself around Ugin now, hiding him away from Sarkhan, enclosing the great dragon in an impenetrable, mystical shell. "What have we done?" came an echoing shout, Yasova's voice, from the top of the chasm. Sarkhan looked up to see her peering down at him from the chasm's edge, a bewildered expression on her face. Framing her, in the sky high above, the dragon tempests churned with new vigor. New dragons erupted from them, shrieking with the simple, unrestrained glory of being. Sarkhan smiled up at Yasova, a crooked smile made of gratitude and simple dumb joy. "What we were meant to," he yelled up at her. "Thank you, Yasova khan." She looked around at the hedron cocoon, confounded, and Sarkhan laughed. It struck him that the chain of events that had brought him here was not a circular joke at all—it was a chain with a purpose. Fate had conspired to place him here, at this crossroads of history, to give him the chance to act. If he had never served Bolas, if he had never been sent to the Eye of Ugin, if he had never come to Tarkir with voices ringing in his broken mind—without all of that hardship, he wouldn't have had a chance to forge a new chain for his world. For the first time in a long while, Sarkhan's skull felt like his own. An unfamiliar sensation of clarity and elation spread through him, as if he were waking from a dream in which his eyes didn't quite work. His thoughts flowed simply, without their usual jaggedness, his consciousness undivided and unbroken. —temporal forces whisked Sarkhan away. Snowflakes fell past Yasova, dropping flecks of white on the snug structure at the bottom of the chasm. Her sabertooth padded over and nuzzled her, and she put her hand on its head. High above, dragons screeched and soared across the sky.